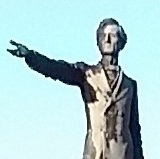 Secessionist Jefferson Davis is gone. Who should occupy his pedestal? Mayor Landrieu’s speech last Friday eloquently described the horrors of the enslavement and deserves recognition as a fine speech. We challenge the mayor to be a leader of deeds, not words. Take ‘Em Down NOLA opposes Mayor Mitch Landrieu’s “go it alone” attitude about deciding what will happen to the remnants of the former Robert E. Lee, P.G.T. Beauregard and Jefferson Davis monuments. These sites belong to the citizens of New Orleans and not to massa Mitch. Citizens must be involved in any decision about their future. The two-year struggle to take down the white supremacy statues (which is really the culmination of a decades-long struggle for removal by the Black community) revolved around whether these statues were on land belonging to the city. State and federal courts ruled that these were indeed public lands belonging to the citizens of New Orleans. The courts further ruled that the city could do whatever it desired to statues present on public lands. Mr. Mayor, it’s not what you say, it’s what you do. The mayor’s attempt to present the future of these former monument spaces as a done deal seems to be an attempt by Mitch to preclude any other voices and opinions from being heard. Take ‘Em Down NOLA calls for a series of town hall meetings where we solicit what residents want to replace these monuments with. We challenge the mayor to have the courage of his convictions. If he really believes that honoring Confederates and white supremacists is wrong, he should join our call to remove all symbols of white supremacy from our public squares, from our public schools, and from our street names. Longtime community organizer and adjunct professor at Southern University at New Orleans, Malcolm Suber is a coordinator of Take ‘Em Down NOLA. The group holds a press conference at 4 p.m. today, May 25, at the corner of Jefferson Davis Parkway and Canal Street.